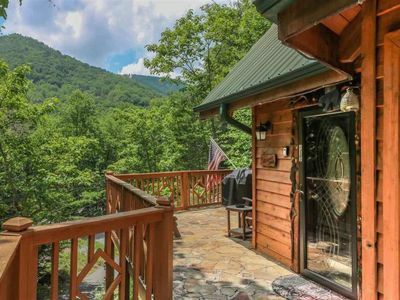 Cozy Cabin w/ Hot Tub & Views - 4 Mi to Dollywood! 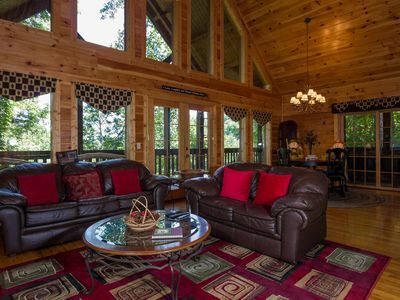 Fall in love with the beauty of the Great Smoky Mountains in this 2-bedroom + queen sleeper sofa, 2-bathroom vacation rental cabin in Sevierville. 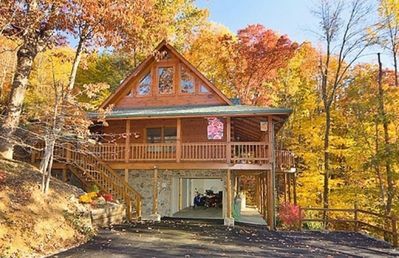 Boasting great views, a hot tub, and expansive deck, this 1,035-square-foot home is perfect for a romantic getaway, family vacation, or marriage retreat. 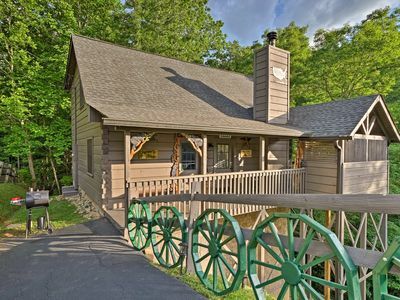 Whether you spend your days exploring Gatlinburg or enjoying Dollywood and the other many Pigeon Forge attractions, your group of 6 is sure to have an unforgettable stay in this cabin! 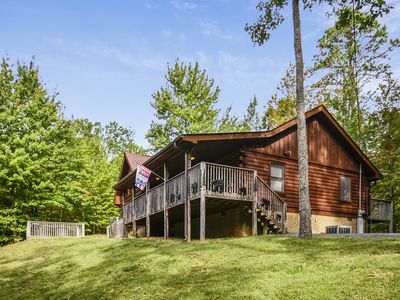 Newly updated with cathedral ceilings, tinted gable windows, and new flooring, furniture and decor, this cabin boasts a rustic-yet-elegant ambiance. 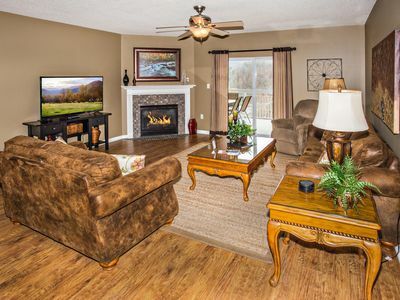 The living room, complete with floor-to-ceiling windows, cathedral ceilings, and a wood-burning fireplace, is the perfect place to gather with your loved ones and watch a movie. 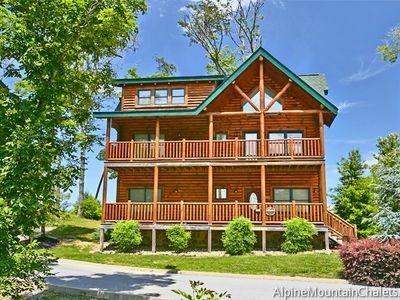 Once the credits have rolled, turn off the flat-screen cable TV and head into the fully equipped kitchen. No matter what you choose to whip up with the stainless steel appliances, you're sure to feel like an Iron Chef as you present your feast at the dining table for 6. 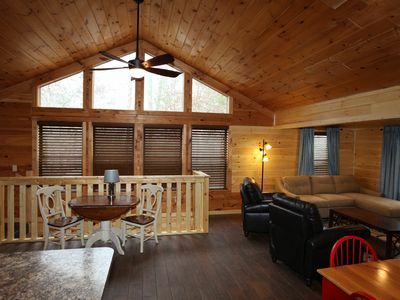 Whether you choose to retire to the master bedroom's plush queen bed or play some pre-bedtime games on the open lofted second bedroom’s multicade console, you're sure to have an enjoyable evening under the cabin's soaring ceilings. Two additional guests can find comfortable accommodations on the queen sleeper sofa with a 6-inch mattress. 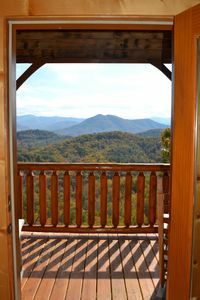 When the southern sun is shining, relax in your own rocking chair while listening to nature on your own private back deck. 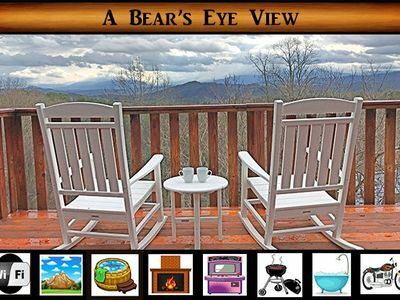 Boasting a dining table, grill, and hot tub, the expansive deck simply can't be beaten! 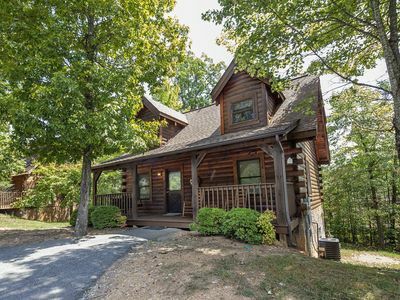 Walk down the road from the cabin and fall in love with the property’s little chapel. This adorable structure is a great place to renew vows or become one with nature. 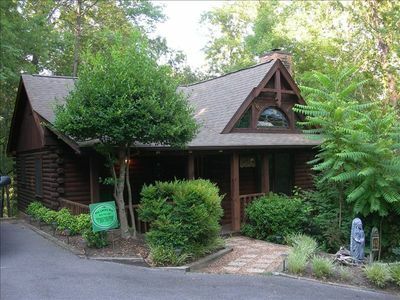 Whether you're young or young at heart, you're sure to love Dollywood. Born from the imagination of country music superstar Dolly Parton, this amusement park is home to top-notch rides, fun games, and much more! 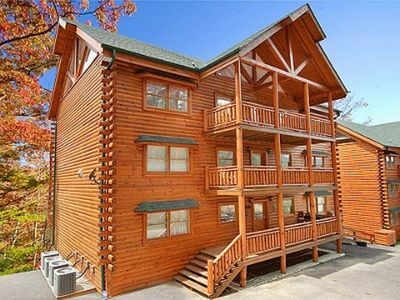 Enjoy Dolly Parton's Stampede, Paula Deans Lumber Jack Show, or spend evening shopping and dining at The Islands. 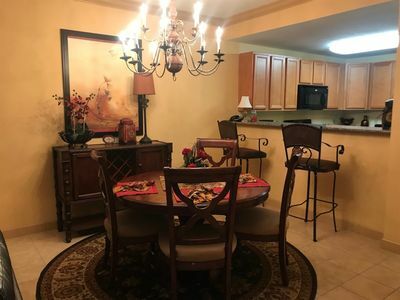 There you can dine at famous restaurants like Paula Deen's or Jimmy Buffets Margaritaville, just minutes away. 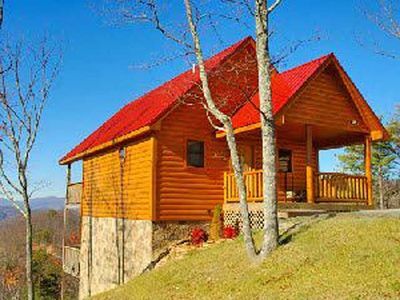 Grab your hiking boots and spend a day exploring Great Smoky Mountain National Park. As you hike through the many trails that slice through the park, you'll pass gorgeous wildflowers, lush forests, and a plethora of water features. For a different perspective of your gorgeous surroundings, take a ride on the Smoky Mountain Alpine Coaster. 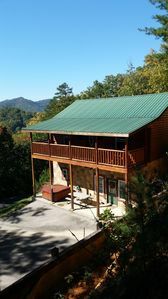 Located just 8 miles from the property, the nation's longest downhill track is fun for people of all ages. 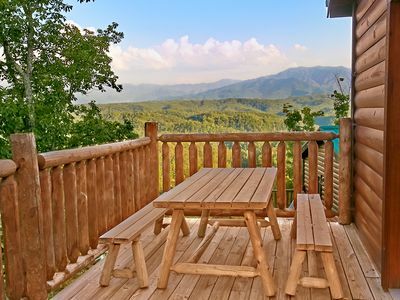 Spend a day exploring the fun-filled town of Gatlinburg. 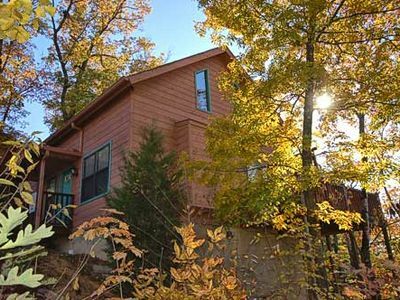 Home to five-star eateries and unique attractions, this mountain town sits just 16 minutes from the cabin. 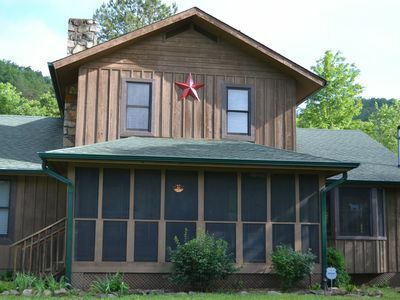 - Amenities include a fully equipped kitchen, 3 flat-screen cable TVs, a chapel on the property, hot tub, large deck, grill, multicade game console, wood-burning fireplace (wood not provided), stainless steel appliances, free WiFi, driveway parking for 2, in-unit laundry machines, and more! ER74 - Gerrald's Chalet - Great location...close to all the action! 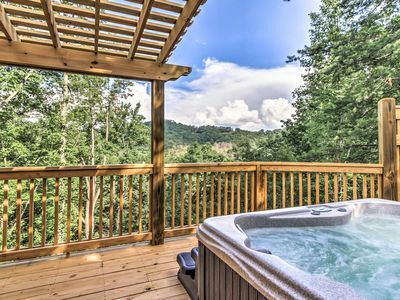 Sevierville Cabin w/ Private Mtn View Hot Tub! 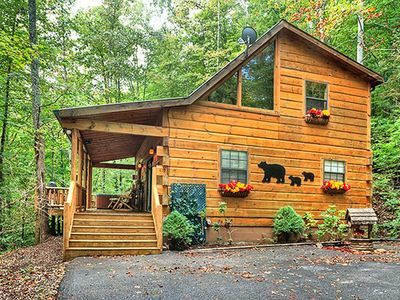 This is a bright, sunny cabin with real log cabin style, breathtaking views! !